Goodreads says, ""Don't believe anything they say." Those were the last words that Annie spoke to Alice before turning her back on their family and vanishing without a trace. Alice spent four years waiting and wondering when the impossibly glamorous sister she idolized would return to her--and what their Hollywood-insider parents had done to drive her away. When Annie does turn up, the blond, broken stranger lying in a coma has no answers for her. But Alice isn't a kid anymore, and this time she won't let anything stand between her and the truth, no matter how ugly. The search for those who beat Annie and left her for dead leads Alice into a treacherous world of tough-talking private eyes, psychopathic movie stars, and troubled starlets--and onto the trail of a young runaway who is the sole witness to an unspeakable crime. What this girl knows could shut down a criminal syndicate and put Annie's attacker behind bars--if Alice can find her first. And she isn't the only one looking." Alice Gates lives a privileged and perfect life in Hollywood during the 1940s, that is until her sister leaves home and she hasn't heard from her since. Four years later, the hospital contacts her saying that her sister, Annie, is seriously injured and unconscious. Of course, Alice rushes to the hospital to find out what happened and as she receives more and more information, she pieces together the clues slowly. The clues take her to a side of Hollywood not often seen. It's a gritty side filled with violent men, drugs, desperate actors, and cops that don't do their jobs. Perhaps the more she learns about who did this to Annie, the more she will not only understand her sister, but also understand why she left all those years ago. With the help of Annie's friend, who is also a private investigator, she find herself right in the center of the dangerous side of Hollywood. Mary McCoy's debut, Dead to Me, is a captivating mystery that kept me guessing. Alice Gates is a fun heroine in Dead to Me. She reminded me a lot of Veronica Mars. She investigates things on her own, probably when she shouldn't, and takes chances that often times can be quite dangerous, all for the sake of finding out what happened to her sister. She throws herself right into the center of the action and in turn, finds out some upsetting information. After each clue, she learns more and more and even learns more about her father, who works for one of Hollywood's studios. My only issue with Alice was the fact that I had to suspend my disbelief from time to time (much like I had to with Veronica Mars) in that she is only sixteen years old and was doing things that seemed a little too far-fetched for me; however, that didn't deter my enjoyment. 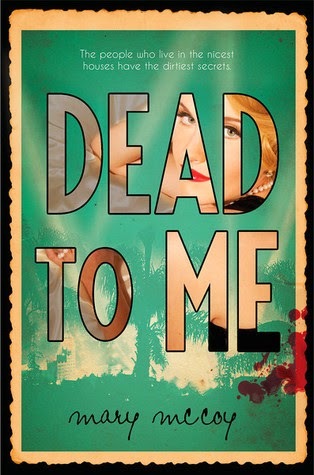 Dead to Me reads like a classic mystery with a film-noir vibe, which is perfect for Hollywood in the 1940s. I found the red-herrings and the clues from McCoy to be well done, especially when trying to figure out the connection between all the various characters in the novel. It took me back to my young adult days of enjoying Nancy Drew. Also, there's not much romance in Dead to Me with its main focus being the mystery, so romance lovers, keep this in mind. Dead to Me can be rather graphic and sordid from time to time. There's underage drinking, gangsters, drugs, violent actors, inappropriate pictures of young adults, etc, so be aware of this before you dive into this novel. It's not the side of Hollywood that you might be expecting to see; it's a closer look into what may be behind the pretty facade in the 1940s. So, if you are in the mood for a true detective story with its heroine, a young girl determined to solve a crime, then check out Dead to Me this winter. I can't wait to hear your thoughts on it. I really enjoyed the setting and film noir vibe. I think you will too, Christina! Thanks for visiting! I like the 1940's setting, and the plot sounds intriguing. I'll look for this one. Me too…best part about the book! Thanks for visiting, Jen! This sounds GREAT, Christina! Thanks so much for sharing your thoughts on this one; I'm going to have to add this to my list. Great post! Thanks, Tara! I hope you enjoy it and let me know your thoughts if you get around to reading it. Thanks for dropping by. This sounds so amazing and I love the time setting. I've been curious about this one but have seen hardly any other reviews of it. Glad to hear you enjoyed it so much! I may be picking this one up soon! The setting and film noir vibe are the best thing about this book. It has a Veronica Mars feel to it as well, which was fun. I hope you get to read it soon! Thanks for visiting, Becky! I enjoyed this too. I also found aspects of it a little unbelievable but overall it was a fun, refreshing change from my usual reads.. I'm glad you enjoyed this one as well. I thought it was a fun read overall, especially if you enjoy mysteries. Thanks for visiting. Jen! I was so excited for this book, but it just wasn't holding my interest so I put it down. I do want to pick it back up soon. These past few months there have been very few books that have held my attention, so I know that it's me, not the book. I'm glad you enjoyed it. Great review! Oh bummer! I hope you can pick it back up. If you like traditional mysteries with a cool setting, then I think you'd like this one. It does pick up, I promise you that! Thanks for visiting, Natalie!